An expert at research, segmentation and planning, Lucy analyzes structured and unstructured data and empowers marketers to do far more in so much less time. Lucy automates labor-intensive tasks and converts data assets into a quickly-searchable source of insights—freeing marketers to focus on complex, higher-level functions. Lucy is a cognitive problem solver. Whether it be product development, determining market segments, doing competitive or market analysis, media planning, writing a marketing plan, developing a marketing strategy, creating organic content—Lucy’s assistance helps with every task. You + Lucy = 3. Lucy absorbs and analyzes all the marketing data a company owns, has ever commissioned and licenses. Ask Lucy a question and she provides comprehensive answers to help you make informed decisions. Lucy is a segmentation expert who assembles complex portraits of target customers, providing you deep insight and uncovering valuable information to help better connect with your audience. Lucy is a master strategist at media planning, developing adjustable models that allow marketers to see the effect of different approaches and then optimizing them to achieve the greatest impact. IBM and its partners know that protecting your information and the information of your customers is essential. 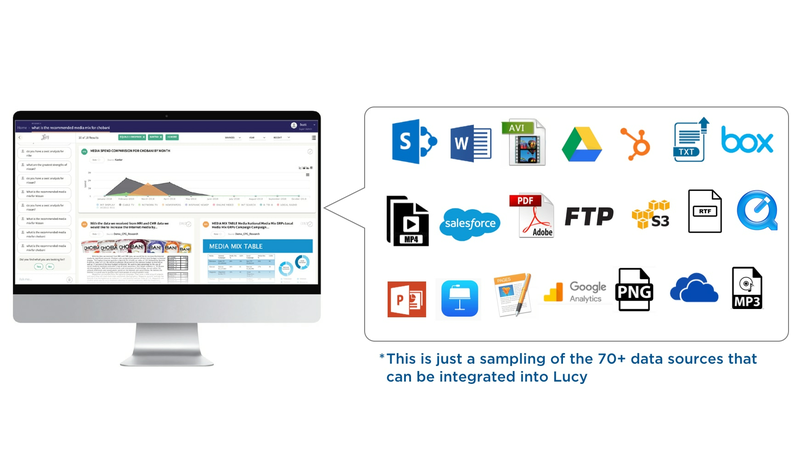 Leverage entirety of enterprise data: Lucy is able to read and analyze a variety of formats including word documents, spreadsheets, PowerPoints, and even PDFs allowing for seamless search through the entirety of enterprise data. Centralize organizations IQ: Lucy can digest all of a companies owned and licensed marketing data, both structured and unstructured, and make it available though one simple interface to transcend organizational boundaries. Search results in natural language: Lucy has been trained to understand marketing terms and built on marketing ontology allowing marketers to find relevant results in seconds rather than traditional methods taking days. 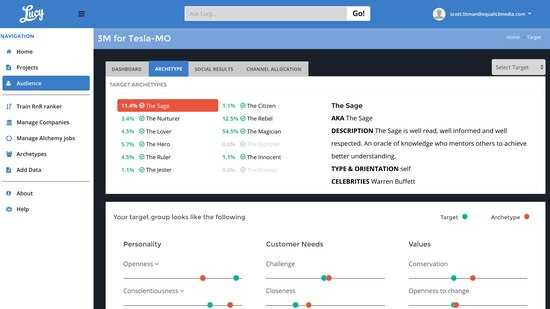 Monetize Insights : Lucy allows a marketer to perform research, build personas, understand media mix, create marketing plans, and build audience segments to drive increased demand generation and conversions.